Day +5: Kiira is still in great spirits. She is active and playful, but sometimes, understandably, grouchy. She has pretty much stopped eating (9 months of feeding therapy gone, but I know we’ll get it back!) and got sick the last 2 nights. We are finally done with chemo and diaper changes every 2 hours! The chemo affects the bladder so they push a ton of fluid through her and we have to weigh all the diapers. It’s annoying at best, for Kiira too. Hopefully we will both get more sleep tonight since they won’t wake her to change diapers. Overall though, I can’t complain. She is doing well and my mom gives me breaks every afternoon. We read the same books all day long and she loves to sit by the window, but doesn’t ask to go outside or go bye bye anymore. Hopefully in a week or 2 we can leave the hospital when Kiira’s white blood cell and absolute neutrophil counts go up. We miss Jason and the girls, but FaceTime is a lifesaver! Day +3: Today we said goodbye to Jason, Miia and Aliisa. It was difficult, but we had a wonderful day together yesterday and sent them on their way this morning. Unfortunately, their flight was delayed so they’ll arrive 7 hours late. Thank you to my mom for staying at the hospital last night so I could stay one more night with the rest of my family and for staying for a few more weeks to help me out! Today Kiira spiked a little fever, so although she played happily for hours this morning, she has just been laying around or sleeping the rest of the day. We did her central line bandage change, which has been a nightmare lately, but today it went much better and her chest is healing. Because of her fever, I didn’t want to torture her with a cool bath, so we did a shampoo cap and full sponge bath, which is required since she started chemo again today. She will have one more large dose tomorrow, and then we’ll finally be done with it. We are thankful for the month we all had together and the good days Kiira has had so far. Miia’s donation went amazingly well–her back is a little tender but overall she is doing great. 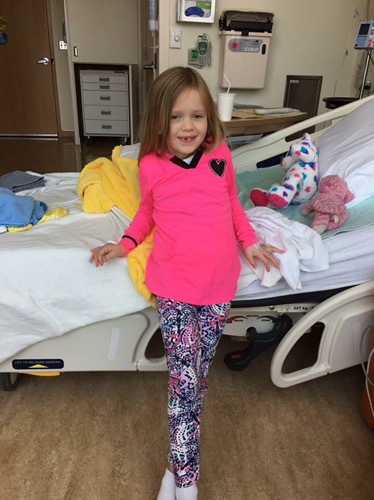 We continue to pray for those cells, which found their way to Kiira’s bone marrow within a day (amazing! ), to grow and that Kiira will feel better soon. We pray that Jason and the girls return home safely and they find a routine that works well for all of them. It will be about 3-1/2 months before Kiira and I can rejoin them at home, if all goes perfectly. 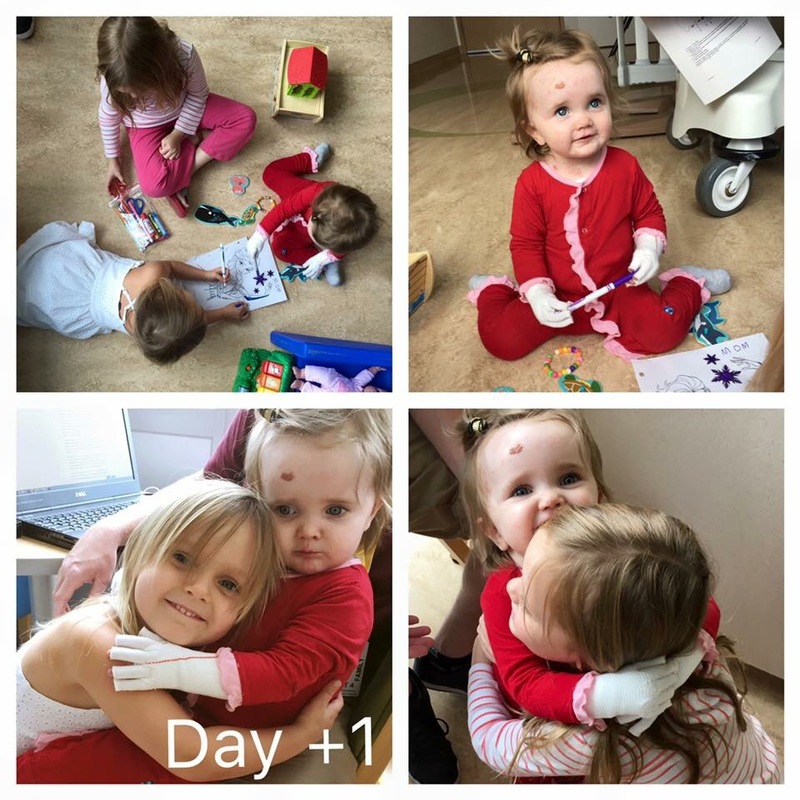 Day +1: Kiira and Miia are both doing great today. We had a few hours where we unhooked Kiira from the IV so she could walk around freely. She gave out a lot of hugs and thrives with her sisters around. She took a tumble though and sheared the skin off her cheek and then hit her lip on the crib and injured it too. She looks very beat up right now but still smiling (pics are from before the fall). Reality is setting in that Jason and the girls leave Saturday. I don’t think either of us have in it us to say more at this point, but I’ll spend tomorrow with the older girls and Jason will be with Kiira. Then we will all try to go to dinner while my mom stays with Kiira. Catt is also doing well so far, although a little nauseous. Day 0: Bone Marrow Transplant Day! Day 0: Today is transplant day!! Miia, Kiira’s sister went in to the OR around 8:30 AM. I was able to be with her while they put her to sleep and though she was crying in that moment, she has been incredibly brave and goes along with whatever we ask of her (except drinking her Tylenol this morning). The procedure took about an hour. She came out of sedation well, but because they had to intubate her, her voice is hoarse and they knocked out her loose front tooth. She was up walking around, eating and drinking within an hour. 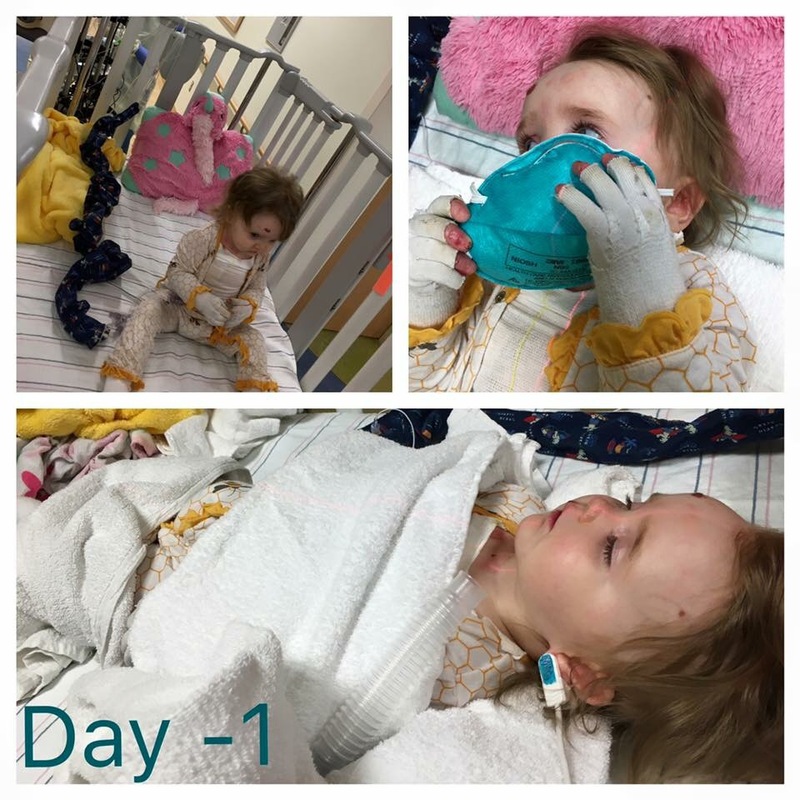 Her recovery is quick and fun with a movie, Popsicles and a new toy. She said she had no pain either and didn’t need a blood transfusion later today, so she is now home. We are beyond proud of Miia and so happy she was able to sacrifice herself in this way for Kiira. 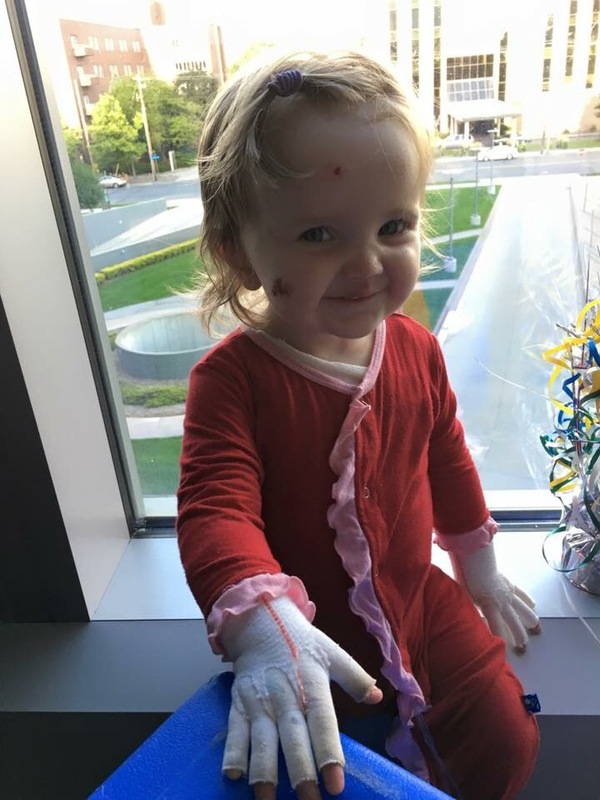 The other positive is that her blood was so rich with stem cells–about 4x the amount they hope for. 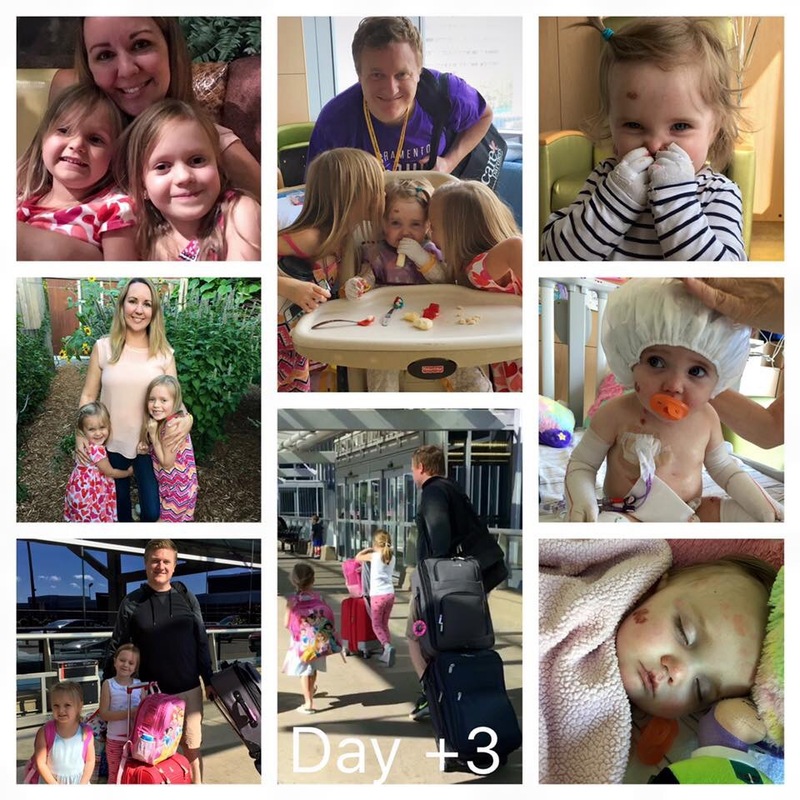 The doctors were pleasantly surprised and we hope that helps Kiira even more. Kiira received those cells at 2:30 pm today. Miia was here to watch and got to unclamp the line to start the flow. It was…beautiful. I don’t know how to describe it, but we are so happy to be at this point. Kiira slept through it all, but has been so happy and energetic tonight. Last time, she started getting sick at this point, so it’s really fun to see both girls having fun, celebrating such a monumental day. The point of chemo and radiation is to lower Kiira’s own immune system, so now her white blood cell (wbc) counts are very low. 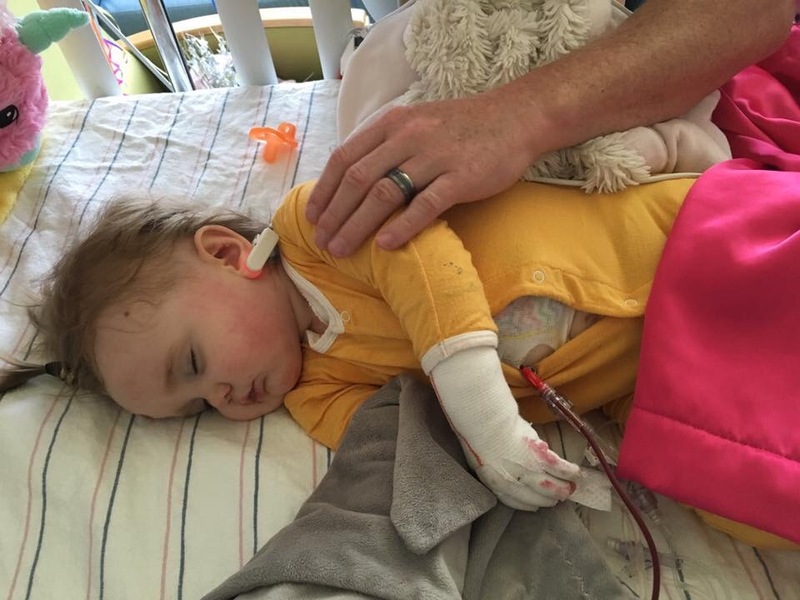 She is extremely susceptible to infection until Miia’s cells start to grow. Kiira still has 2 doses of chemo over this weekend too. As Miia left tonight, she asked if Kiira’s owies will be gone tomorrow. Such a sweet, innocent question, and one that comes up often as we talk about doing a BMT for EB. A BMT is not a cure and is a very long term, complicated process. 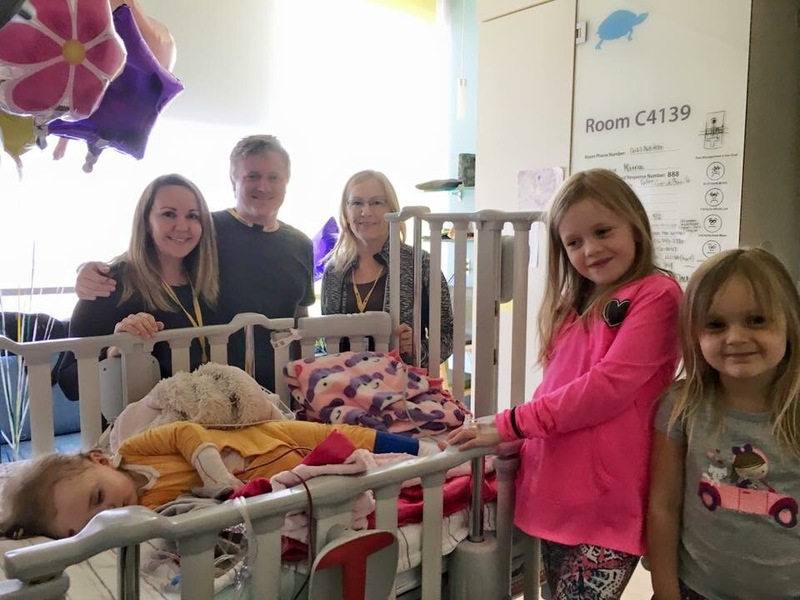 Over the upcoming YEARS it should help Kiira to not get injured as easily and help her heal faster, but it is not designed to completely take away EB–only gene editing can do that. However, we are hopeful that as Miia’s cells grow in Kiira, they will go to injured areas of skin and heal them with the corrected gene, which would then give her Collagen VII in those areas and make her skin stronger. The outcome would be to slow the progression of EB while we wait for a cure. Damage to the skin is irreversible and scars are deep, so minimizing the damage now will help Kiira in the long-run. So in short, we need Miia’s cells to grow steadily and become stronger than Kiira’s. Thank you so much for all your prayers. We know today went so well as a result. Day -1: Today Kiira was sedated for her total body irradiation. It will make her sick eventually and lead to mucositis, but we didn’t have too many side effects last time and hoping for the same this time. I did Kiira’s bandages in the recovery room, but we had to do her central line bandage change in her room. My sweet friend Gabriella came to help, but Kiira’s skin was so damaged from the last one. The adhesive remover and cleaner stung her wounds and some bandages were stuck to the torn skin. Nothing has even started healing in 2 days, so we tried to keep anything sticky from her the open wounds this time. Kiira screamed and writhed in pain. I do not know what I’ll do if we keep going through this–if EB gets to the point where this is a daily thing, central line or not. Admittedly, I felt like I was going to pass out. I’ve dealt with a lot of her wounds and pop blisters daily, but something about this tore at my heart as she looked into my eyes, tears streaming down her cheeks. God, I pray this BMT helps her! Kiira was very sleepy after and fell asleep to the strumming of a guitar. Tonight she had a slight temperature and red cheeks–almost like she was sunburned, but full of energy and joy. Miia also had her physical and blood test today. Tomorrow we arrive at 6am for her sedation and harvest of bone marrow, as they call it. She will get a needle in each hip bone from the back. When she wakes, she will be admitted to the BMT floor while her blood/stem cells are processed. Then she will get to watch Kiira get her stem cells tomorrow afternoon. I cannot believe this day is here! Love for Baby Catt and Kiira are on the same track. Catt is doing well so far too and getting her BMT tomorrow too. Please keep them both in your prayers! Day -2: Today was Kiira’s last dose of chemo for several days. Tomorrow she has total body radiation. 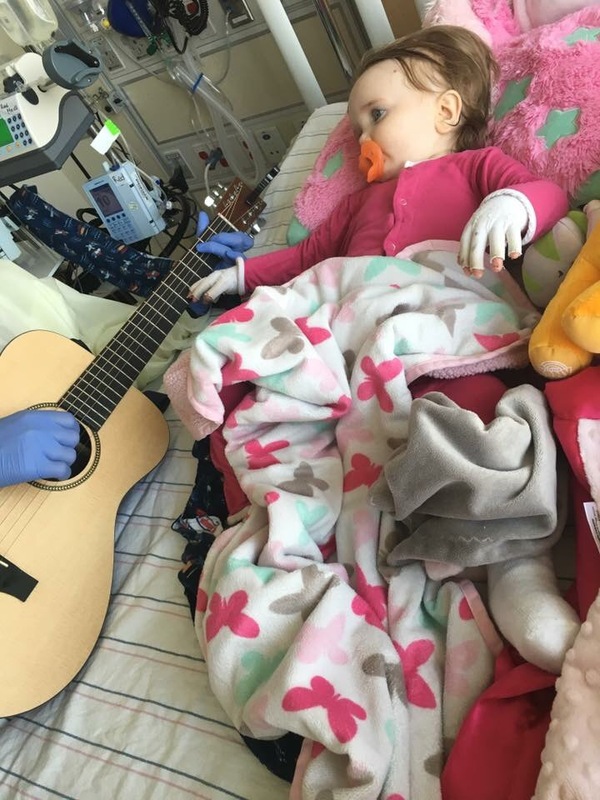 The dose, like last year, is far less than leukemia patients receive, but it’s goal is still to kill off Kiira’s bone marrow, which can cause numerous other issues in her body too. This is part of the challenge of deciding how much to put her through vs what EB will put her through. I don’t think there’s a right answer, but we continue to hold on to the hope that it will help more than it will hurt.